As the new Duchess of Sussex after Royal Wedding on May 19, Meghan Markle made her first appearance with Prince Harry which primarily caught the attention of all along with her flashed new diamond bracelet which is reported to be of $20,000. Accompanying Prince Harry to attend a garden party as part of year-long celebrations for the 70th birthday of her new father-in-law, Prince Charles, Duchess of Sussex was spotted with a new bit of bling alongside her engagement and wedding ring on the left arm, this Tuesday. 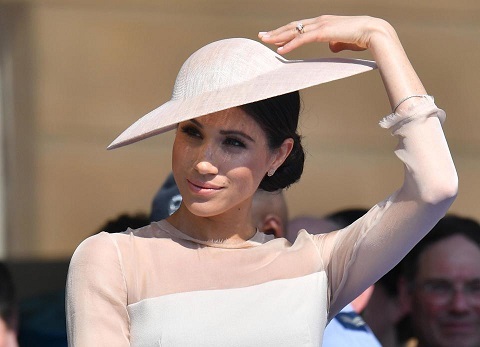 Megan stepped out in her stunning peachy-pink dress and bespoke Philip Treacy hat, designed by GOAT, which costs $787.85 from Matches Fashion, while her diamond adornment got a moment to shine out. Sources claim that the stunning and delicate diamond tennis bracelet was gifted by Prince Harry on their wedding night. As reported, Prince could be continuing his a sweet tradition honoring his late mother, Princess Diana, as she also received a similar diamond tennis bracelet on her wedding night.